Cotton is the most common yarn derived from plants that we hooksters and knitters use, and it was with this in mind that I went to an exhibition by Alke Schmidt at the William Morris Gallery last month. 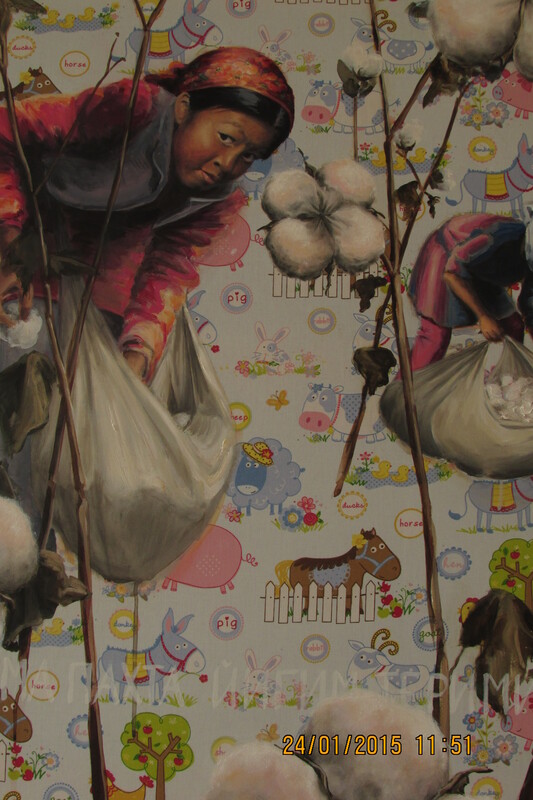 Entitled Tangled Yarns the exhibition examined, through painting and textile arts, the often contradictory politics and morality inherent in the cotton and textile industries over the past two centuries. 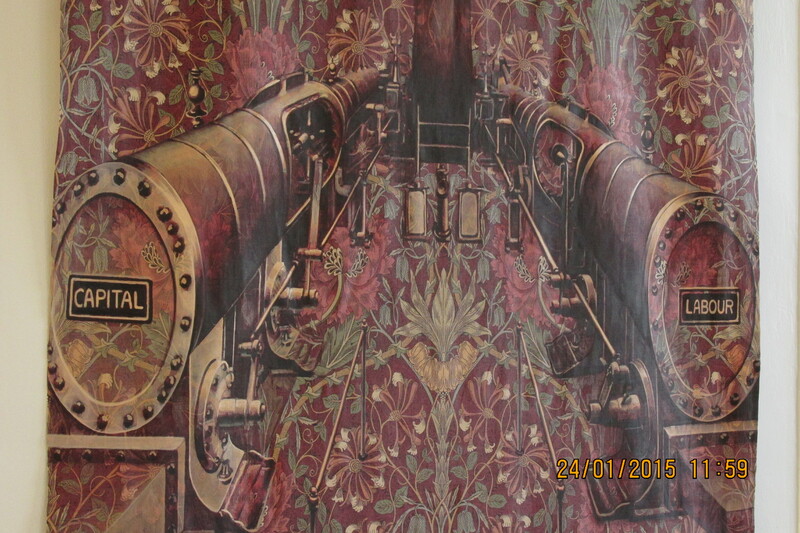 Morris’s Dilemma depicts an 1892 triple-expansion spinning mill engine, its cylinders bearing the words CAPITAL and LABOUR. The engine is superimposed against a Morris design: Honeysuckle and Tulip. This piece is easily relevant to the hookster, crochet being an as yet unmechanised craft. What this means. of course, is that our work is more time-consuming. To ask a price for our products that reflects the hours we put into making them may well render the item too expensive for many a purse. William Morris wanted to make useful things beautiful and beauty accessible by everyone. But the irony is that handcrafting goods is rarely both egalitarian and profitable. Morris himself realised this. Though he was horrified by the industrial system of mass production observed in the Lancashire mills, he utilised cloth manufactured there for his printed cottons as this was his only real financially viable option. 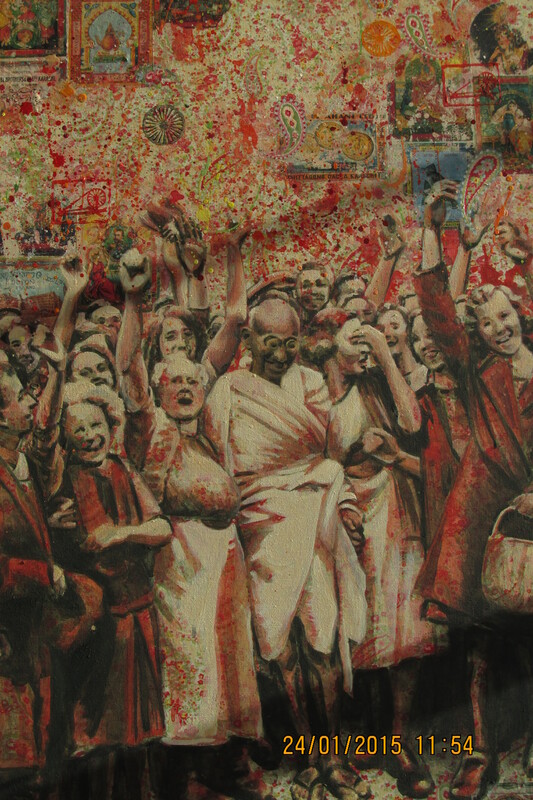 A different attitude to mass production was highlighted in End of Empire, which portrays Mahatma Gandhi’s 1931 visit to the Lancashire mills. Though his visit coincided with serious decline in the industry and high unemployment, he was keen to elucidate his push for a boycott of English cloth exports to India. Despite this, Gandhi was welcomed by the workers “as one of their own”. The problem as Gandhi saw it was that the cheaper, faster production of industrially manufactured cotton was devastating the Indian hand-loom trade, and he urged his followers to return to locally spun cloth. This all linked in with Indian independence, and the spinning wheel and hand-loom were taken up as symbols of that struggle. Child’s Play draws attention to the conditions of the workers that harvest cotton in Uzbekistan today. This country is the fifth biggest exporter of cotton in the world, and child labour was a problem there until 2013. Whilst this seems to have abated, the forced labour of adults persists. Picking cotton by hand results in a finer quality product than if machine harvested. To my mind, forced labour could also apply to environmental degradation and the forcing of nature. Cotton accounts for approximately half of all textiles in the world and, by and large, is farmed in an unsustainable way: water sources are depleted in areas of scarcity, water that remains is polluted by chemicals applied to the crop, and soil also becomes contaminated as well as vulnerable to erosion. The impact this has on ecosystems and biodiversity is huge. What affects the environment inevitably has repercussions for humankind. The first to suffer will be those same communities subjected to forced labour. Just as there are fair trade and organic clothing companies, there are yarn manufacturers who press for social and environmental justice. For example, Debbie Bliss has generated a range of cotton yarn that is fairly traded and eco-friendly. 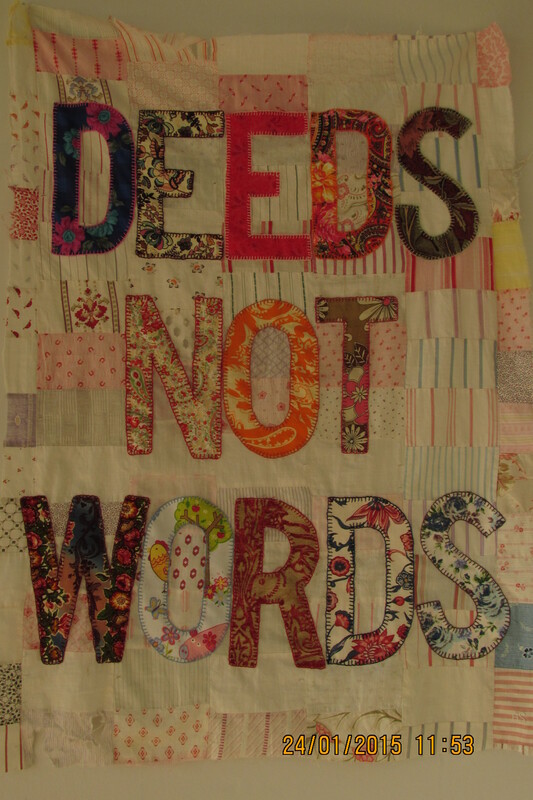 Deeds Not Words was the last piece in the exhibition and echoes one of the rallying slogans of the Suffragettes. It encourages us to make enduring changes in the textile industry whatever link in the supply chain we are. This brings me back to Morris’s dilemma, which I think belongs to everyone. After all, what crafter wouldn’t want people to be treated fairly? But for those of us on tight budgets (myself included), ten balls of yarn to make a jumper may well end up being too costly. The least we can do is compare and contrast yarns and, where possible, substitute ethically produced yarn if they are similarly priced. I have recently discovered an indie yarn shop called Knit With Attitude which sells only ethical yarns, and I’ve noticed some that are reasonably priced. The website has an excellent section on the companies whose products are sold in the shop, so it’s well worth having a nosey. And as the shop is not too far from where I live, I’ll certainly be frequenting there in future!